We are always try to making easy process to Bypass A6000 FRP, so here we share another latest Method to FRP Bypass OnePlus 6 (Android-9.0), This is the updated method to Bypass Google FRP OnePlus 6 (Android-9.0), we all know FRP Bypass OnePlus 6 (Android-9.0) is now a little bit difficult because of new software update and new security patch, OnePlus has always try to add extra security features to their devices, to successfully Bypass Google FRP OnePlus 6 (Android-9.0) follow the below process very carefully. OnePlus 6 is the latest Android smart phones , which comes with a “6.28” inches Optic AMOLED display and powered by Octa-core processor 2.8 GHz with 6/8 GB RAM and 128/64/256 GB of ROM and it runs on Android Oreo 8.1 OS . 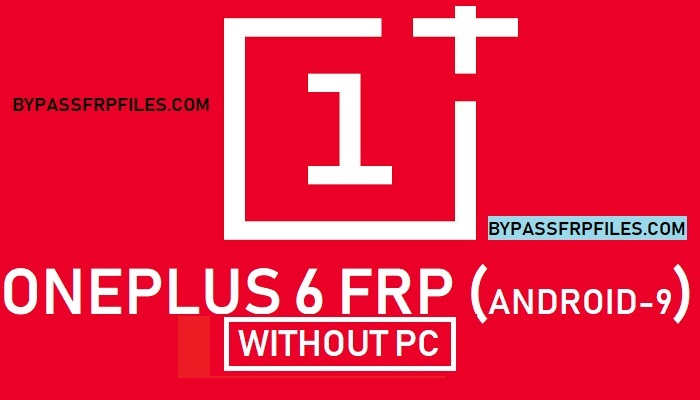 If you are the owner of OnePlus 6 and after the if you forget the Gmail ID and want to bypass Google Account to access your device home screen then you are here in the right place as We given a tutorial below to FRP Bypass OnePlus 6 (Android-9.0) you need to download some files and download FRP Applications . Once you had done then you can easily Bypass Google FRP OnePlus 6 (Android-9) easily, then you will be access your device home screen. Warning:-This Method is only for devices owners. Note: This method is successfully applied to OnePlus 6. you can follow this method to any of your OnePlus 6 (OnePlus A6000 FRP). Only try this method to FRP Bypass OnePlus 6 (Android-9.0). -First switch on your OnePlus 6. -After that, tap on next and Connect your OnePlus 6 to any working Wifi Connection. -Then, Get back to the main “Welcome Screen” again. -Now, you need to enable magnification feature to Bypass Google Account OnePlus 6 (Android-9.0) (OnePlus A6000 FRP). -From the “Welcome Screen” of your device. Tap on “Vision Settings”. -Then tap on “magnification” then tap “Magnify With Triple Tap. -After that, we will get “Magnify with Triple-tap” screen. -Just tap on the “Search” icon and type and search for “Youtube”. -Then go down and check “Youtube” application will show there. -Now tap on the “Youtube” search result. -Then you will be redirected to “Youtube” app info settings. -Boom, Now you will access “Chrome Browser” on your device. -Congrats, Once you access “Chrome” browser then you need to download some files and tools to successfully FRP Bypass OnePlus 6 (Android-9.0). -Now tap on “Accept & Continue” after then tap on “No Thanks” button. -After that, you have successfully accessed to “Chrome browser”. -Then, We need to download android Frp tools to Bypass Google FRP OnePlus 6 (Android-9.0). -Then goto very first search result. That is according to our Site “Gadgetsdr.com“. -Now download from there, Bypass FRP applications. -First, download from there “Apex Launcher.apk” from there. -Once downloading finished, we will get a popup, just tap on the “Open” button from there. -Now you will get again a “Security popup window” on your device screen. -Then just tap on “Settings” from that popup screen. -After that, enable “Allow form this source” from there install your apk applications. -Then go back by tapping on “back key”. -Now you will get “Apex Luncher.apk” installation screen. -Just tap on “Install-> Open. -Wow, now you can access your device home screen, but FRP is still on so now FRP Bypass OnePlus 6 (Android-9.0) to access your devices home screen fully. -Then go to the “FRP Tools” page once again. -Download from there “2” applications. -Once you access your device home screen again, then click on the “Menu” icon then go to “Files” from there. -Now go to downloads folder and install the “Google Account Manager (6).apk” from there. -By tap on the “Install” and then “Done”. -Ok now Install the “FRP Bypass GD.apk” to Bypass OnePlus A6000 FRP. -By tap on the “Install” and then tap “Open” button. -you can now access “FRP Bypass” applications on your device. -Wooohooo, now you have only one steps away to Bypass Google FRP OnePlus 6 (Android-9.0). -Then Reboot your OnePlus 6 .to Check “FRP Bypass OnePlus 6″ successfully. -Then complete setup and then you can see “Account Added” option on your device, thats mean you have successfully Bypass OnePlus A6000 FRP easily. Thanks for visiting us, Comment below if you face any problem With Bypass Google FRP OnePlus 6 (Bypass OnePlus A6000 FRP), we will try to solve your problem as soon as possible. you can check other some tutorial here to help you.